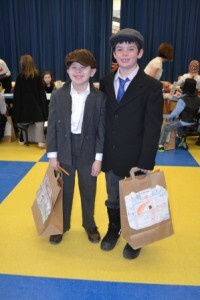 Westborough – Second-grade students at the Annie E. Fales Elementary School were able to experience immigration to the United States as it was in the early 1900s, thanks to a grant furnished by the Westborough Education Foundation (WEF). 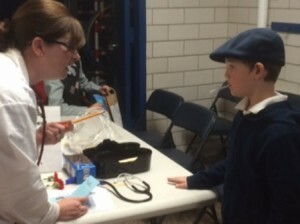 The grant money was used by second-grade teachers Kathy Swanson and Patty Gallo for the program entitled “Coming to America – An Ellis Island Experience.” The realistic details of the day provided a hands-on living history of the immigration process for the students and perfectly complimented their unit on immigration. 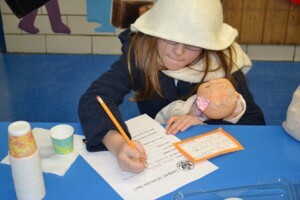 The students each looked back into their family history and picked a relative that came through Ellis Island. They researched which countries their ancestors emigrated from and what their reasons were for starting a new life in America. The students dressed in turn of the century outfits including babushkas for the girls and suits and caps for the boys. After a harrowing weather-filled, six-day steamship ride with some passengers in the steerage class, the children were greeted in New York Harbor by the Statue of Liberty. From there the students were guided through the immigration process complete with passport stamps, declarations of family, money and goods, baggage checks and a health and medical exam. The students also discovered a new life in America was not easy. They took turns trying their hands at assembly line factory work for the wage of one cent per week. Under grueling conditions of no talking, no eating and no breaks they produced their daily quota of colored macaroni necklaces. To complete the process the new arrivals learned the Pledge of Allegiance, reviewed the symbols of their new homeland and took the oath of citizenship. Finally, the freshly minted Americans gathered to sing traditional American songs. 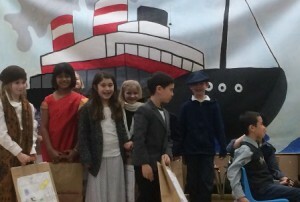 Second-graders at Fales Elementary School disembark from the ship bringing them to America. 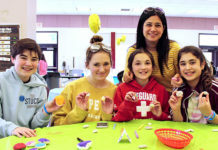 The WEF is an independent nonprofit organization dedicated to providing financial support for projects and programs that expand educational opportunities, foster and stimulate creativity and enhance the excellence of academic experiences for Westborough students. WEF supports innovative initiatives that are above and beyond the base curriculum requirements and are outside the scope of the normal school budget. Last year, the foundation awarded over $19,000 in grants. The WEF evaluates funding proposals from teachers, administrators, and students in each of the Westborough Public Schools for any project, activity or program which offers enrichment to the educational experience of Westborough students in science, math, literature, languages, social studies and the arts. This year’s grant deadline is Friday, March 20. The application and more information can be found at www.westborougheducationfoundation.com. A student fills out the forms for immigration to the United States. 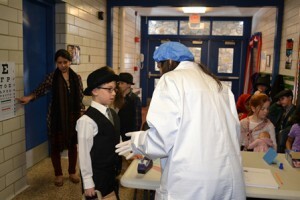 “Doctors” examine the immigrants before they are granted entry.